Scrum is a framework to manage complex projects based on empirical process control mechanisms. Scrum is based on inspection, adaption, timebox and transparency. Scrum teams do work in timeboxes called Sprint which is either 1, 2, 3, or 4 weeks. ScrumMaster is a leadership role who facilitates scrum ceremonies, keeps the team together, coaches team on Scrum and agile and makes impediments visible. Product Owner is the customer representative or customer who specifies what needs to be done in a an order and accepts work when done. Team has 5- 9 people that does the work for the product owner and shows an increment of work each iteration. Scrum Ceremonies are Sprint Planning, Daily Scrum, Sprint Review and Retrospective. 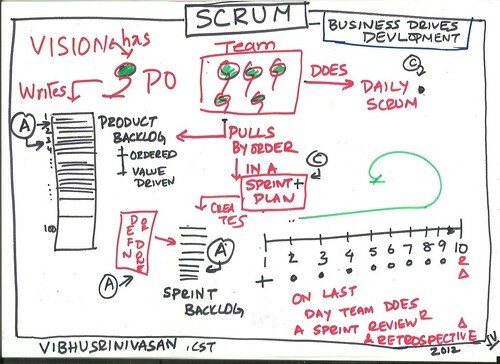 Scrum can apply to any kind of work that can be planned for at least a week.